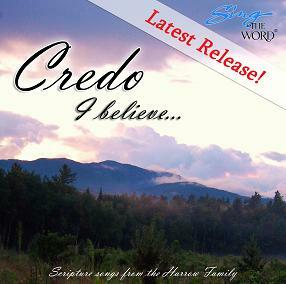 We are pleased to announce a new CD, the 7th release from the Sing The Word CD series by the Harrow Family: Credo is filled with dynamic and colorful songs tailored to 8 Scripture passages. Many of the Scriptures are longer than previous recordings, as this CD is targeted for ages 11 and up. The title derives its name from the first song, “The Apostle’s Creed”. They use the traditional creed that is most often recited in churches today, dating back 1800 years! This musical setting is guaranteed to captivate your imagination: it begins with the first line of the creed sung in Latin by a children’s vocal ensemble in Gregorian-chant style, followed by a bass flute solo by their daughter, Naomi. Their daughter, Hannah, beautifully sings through the entire creed (in English of course!). The finish includes an “army” of snare drums with the chorus resounding in 3-part harmony. This collection includes hallmark Scripture passages. The 1st Corinthians 13 “love” chapter is a colorful arrangement for orchestra. The “Ten Commandments” setting harkens back to the drama of Sinai with its striking array of cymbals, gongs, and men’s deep choral sounds. There are two entire psalms included: 15 and 90. Psalm 90 is a remarkable text with its variety of mood and message. We have captured the opening declaration (“Lord, You have been our dwelling place in all generations”), the acknowledgement of God’s displeasure (“…all our days have declined in Your fury”), and the final mournful appeal (“do return, O Lord”) with three unique musical accompaniments. Their goal here (as in all of their recordings) is to tailor the music to the text so that the listener receives insight into its meaning. Psalm 90 continues that vision as each section illuminates the Scripture for you. The “Word Made Flesh”, from John 1:14, features the captivating sound of Roger Nye’s bassoon. (Roger is a member of the New York Philharmonic Orchestra). “My Son Do Not Forget” is a light-hearted upbeat discourse with Steve Harrow and his daughters each taking a verse. Micah, their son, drives this one along with his cajon – a wooden box that is played with the hands while sitting right on top of it. The CD closes with the song “The Resurrection and the Life”. The final phrase is Jesus’ arresting question “believest thou this?” Since this last line of the entire CD is a question, they end it using a chord that makes the song sound like a musical question as well (the song ends with the “5” or dominant chord, instead of the tonic or “1” chord). These 8 Scripture songs are recommended for ages 11 and up, but Credo will be enjoyed by the entire family. Instrumental-only tracks are included for memory practice, and performance. Bible versions used: NAS and NKJV, KJV.